Today were going to talk about termite control options for repairs and new construction and termite resistant wood choices that your Hi-Tech professional can use when performing repairs. Here’s a question to consider: What kind of wood was used in the construction of your home? When it comes to new construction and structural repairs, there are many different kinds of lumber to choose from. Let’s look at the kinds of lumber that are out there and how they rate when it comes to termite resistance. For areas that are exposed to weather, your inspector will recommend only “exterior grade” pressure-treated timber. But how would one expect to know something like that? It turns out everything you need to know about finish, framing and composite woods is printed on what is called a “grade stamp” on every board sold in the United States. The most common types of wood used for structural lumber are Douglas fir, Hemlock, Cedar and Spruce. Douglas fir and Cedar are somewhat termite resistant, but Hemlock and Spruce are not. However, wood that is not naturally termite resistant can be treated to make it resistant. With new construction or repair, any lumber that will have direct contact with the ground should be treated lumber. Treated lumbers do not guarantee that termites will not invade the wood, but they can act as a deterrent for structures such as decks and patios. What’s more is that home improvement centers now offer concrete supports that raise the wooden support beams for decks and patios off of the ground. Otherwise, the chemical in the lumber may leech from the wood. Topical treatments, particularly borates that will be exposed to weather, also must have a sealer coat to stop the termiticides from leeching into the ground following rain. 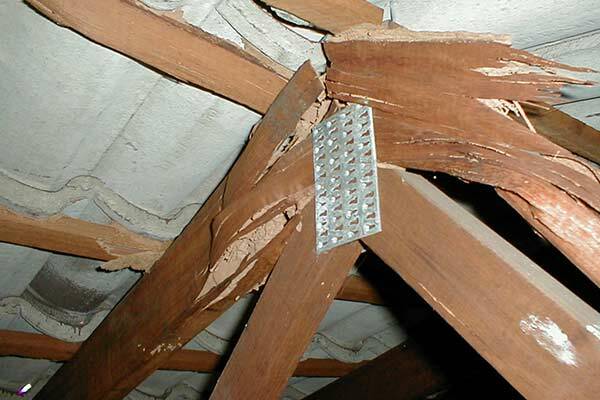 In addition, when performing structural repairs, primer should generally be applied to the wood, as this protects it against moisture and helps to prevent wood rot, moisture damage, and future termite infestation. When it comes to new construction or structural repairs, an ounce of termite prevention and awareness about how to turn your wood into termite resistant wood really is worth a pound of cure.